Physicians may want to dig a little deeper into their closets, or grab their white coats on the way out of the operating room, if they want patients to view them favorably, according to the largest-ever study of patient preferences for doctors' attire. In fact, what medical doctors wear may matter more than most doctors—or even patients—might think, say the researchers behind the new paper in BMJ Open. Based on their findings, they call for more hospitals, health systems and practice groups to look at their dress standards for physicians, or create them if they don't already have one. Just over half of the 4,062 patients surveyed in the clinics and hospitals of ten major medical centers said that what physicians wear is important to them—and more than one-third said that what a doctor wears influences their satisfaction with their care. "Professional dress on Wall Street, law and nearly every other industry is relatively clear—and it typically mirrors what applicants would wear to their job interview," says Christopher Petrilli, M.D., lead author of the study and an assistant professor of hospital medicine at the University of Michigan Medical School, who worked in the finance industry before entering medicine. "In medicine, the dress code is quite heterogeneous, but as physicians we should make sure that our attire reflects a certain level of professionalism that is also mindful of patients' preferences." The study also asked patients to look at pictures of male and female physicians in seven different forms of attire, and to think of them in both inpatient and outpatient clinical settings. For each photo, they rated the providers on how knowledgeable, trustworthy, caring and approachable the physician appeared, and how comfortable the attire made the patient feel. Formal attire with a white coat got the highest score on the composite of five measures, and was especially popular with people over age 65. It was followed by scrubs with a white coat, and formal attire without a white coat. 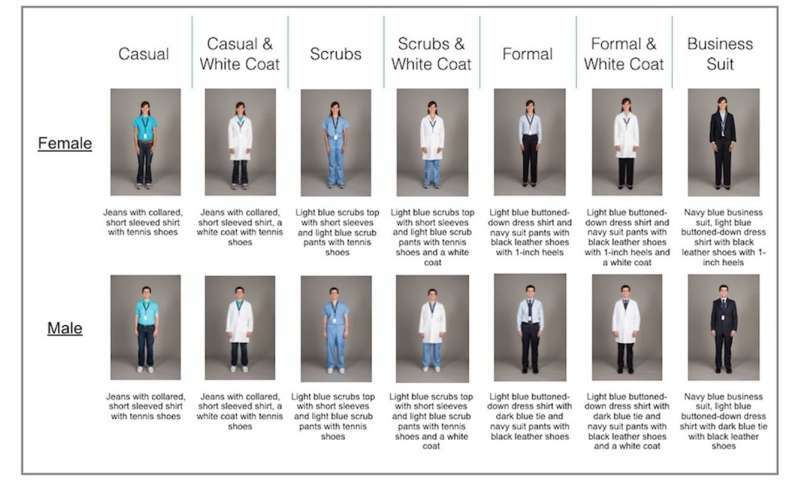 When asked directly what they thought their own doctors should wear, 44 percent said the formal attire with white coat, and 26 percent said scrubs with a white coat. 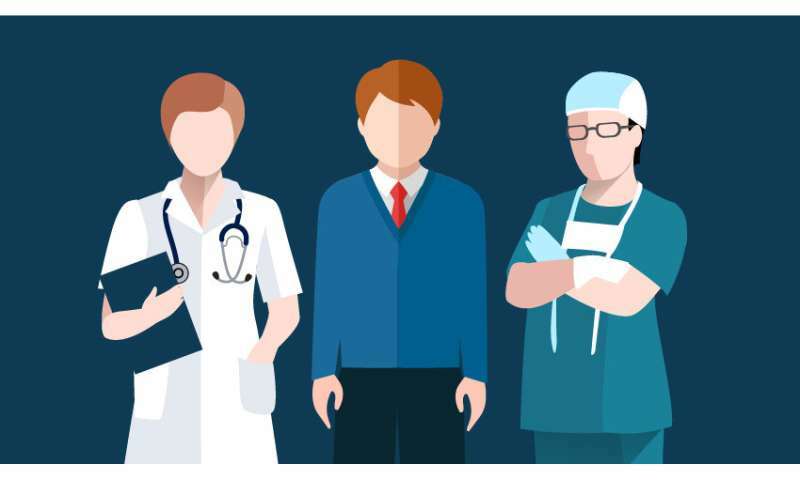 When asked what they would prefer surgeons and emergency physicians wear, scrubs alone got 34 percent of the vote, followed by scrubs with a white coat with 23 percent. The results were largely the same for physicians of either gender except for male surgeons. Patients tended to prefer that they go with formal wear, without a white coat. The setting of care mattered, too. Sixty-two percent agreed or strongly agreed that when seeing patients in the hospital, doctors should wear a white coat, and 55 percent said the same for doctors seeing patients in an office setting. The percentage preferring a white coat fell to 44 percent for emergency physicians. Though the surveys were conducted during business hours on weekdays, the researchers asked patients what they thought doctors should wear when seeing patients on weekends. In this case, 44 percent said the short-sleeved outfit with jeans was appropriate, though 56 percent were neutral or disapproved of such a look even on weekends. Interestingly, patients in the northeast and midwest parts of the country were less insistent on white coats and formal attire—38 percent and 40 percent preferred it in these regions, compared with 50 percent in the west and 51 percent in the south. Northeasterners were more than twice as likely as southerners to prefer scrubs alone for surgeons. Tying physician attire to patient satisfaction isn't just an exercise—hospitals are paid by the Centers for Medicare and Medicaid based in part on scores on patient satisfaction surveys. Before launching the study that led to the new paper, the researchers reviewed the medical literature for other studies on this topic, and published their findings three years ago. They also contacted top hospitals across the country and found that only a few at the time had formal guidance for physicians on their attire. "This is by far the largest study to date in this area. 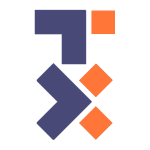 We used the expertise gained from our previous systematic review along with a panel of psychometricians, research scientists, choice architects, survey experts, and bioethicists to develop our study instrument. Given the size, methodological rigor and representativeness of these data, local, nuanced policies addressing physician attire should be considered to improve the patient experience," says Petrilli, who treats patients in the hospitals of Michigan Medicine, U-M's academic medical center, and holds a position at the VA Ann Arbor Healthcare System. He is a member of the U-M Institute for Healthcare Policy and Innovation. The researchers note that while studies have shown that while physicians' white coats, neckties and sleeves have been shown to harbor infectious organisms, leading some countries to require physicians' arms to be "bare below the elbow," no studies have shown actual transmission of infection to patients through contact with physician attire. 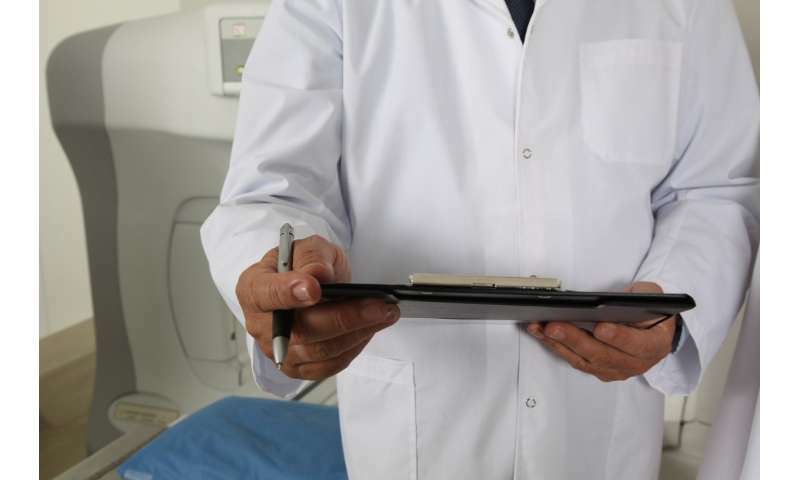 However, other research has suggested that physicians may be more attentive to tasks when wearing their white coats, perhaps increasing patient safety. "Patients appear to care about attire and may expect to see their doctor in certain ways. Which may explain why even white lab coats received a high rating for 'approachability' - patients may see a white coat similar to a physician's 'uniform' and may similarly also expect formal attire in most settings," notes Petrilli, who is a member of the U-M/VA Patient Safety Enhancement Program. "Patients don't always have the opportunity to choose their doctor. In this era of appropriately increased focus on patient centeredness and satisfaction, physician attire may be an important, easily modifiable component of the patient care experience." For consistency, and to keep other factors from influencing ratings, all the physicians shown were young, slender and Caucasian. Patients were approached in the outpatient waiting rooms of general medicine and specialty clinics, and non-surgical inpatient units. About two-thirds of the surveys were completed by inpatients, and the sample was 71 percent white and 65 percent male, with 70 percent having attended some college or having a college degree.